How do you stop a runaway freight train? Well, you don’t stop it by placing Park Ji Sung in front of it. The runaway freight train I’m alluding to is Yaya Toure, this week’s Player of the Week after his magnificent performance against Manchester United. 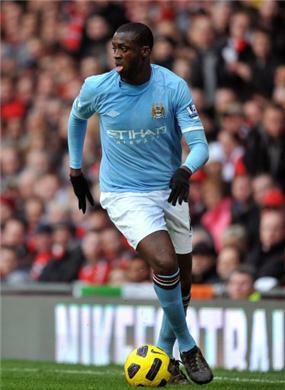 The Ivorian was simply unstoppable in the Manchester derby, proving yet again that he is one of the most complete footballers in the world at the moment. With Manchester United reticent in their set up, Toure destructed their parked bus with his forceful, regal runs severely exposing the weak core of their midfield. A common criticism of the Ivorian is the way he visibly fades towards the final third of games (this weakness was apparent at the Africa Cup of Nations – he was notably withdrawn after 87 minutes in the final after beginning to look clumsy, not playing extra-time), but there was little sign of fatigue on Monday night. With Man Utd’s midfield battered and bruised and space opening up in the final third of the game, Toure finished the game strongly, threatening on more than one occasion to add the oomph to the scoreline that Manchester City’s dominance deserved.